February 23, 24, 25, 26 & 27, 1971. JP wrote: “This play takes us back to the late Edwardian era, Gay Paris and the false securities of pre-1914. Our General St. Pe’ is very much the peace-time officer with family problems! He dwells in the romantic past with the imagination of a Cassanova, ridiculous, loveable and possessing a touch of comic frailty. He and his ladies live around us to-day. The same wish to escape their age and live in a private world of memories and past glories. The waltz of human comedy – a battlefield! Jean Anouilh gives us a work of art – full of devilish cunning and sweetness, an insight into our lives. 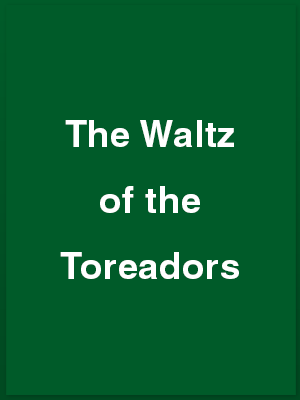 WICK Theatre Company is this week scoring another triumph with its brilliant presentation of Waltz of the Toreadors at the Barn Theatre, Southwick [final performance, tomorrow, Saturday]. Jon Peaty’s direction of the play is worthy of high praise and the settings he has designed are excellent. Another remarkable feature is the accuracy of the costumes of the period, which were made expertly by Frances Moulton, assisted by Carol Brand. Their richness adds much to the colour of this well-acted play. The action passes in General St. Pé’s room adjoining his wife’s bedroom, which one can see into, through a gauze curtain, which is quite effective. They live in a small, provincial garrison town and it is a spring day some time before the First World War. A most difficult play to interpret, Brian Moulton stage manager is effectively assisted by David Wiltshire, and none of the characters losses the essential French quality of humour and farce. In the part of the general, ageing and with family problems, Jack Bingham is brilliant. Hardly ever off the stage, he never seems to lose his tragic-comic figure of a peace-time officer living on past glories and romantic associations of a woman friend Mlle Chislaine de Ste-Euverte, whom he has loved for 17 years and who is superbly portrayed by Hilary Wiltshire. His wife, Emily, sick and ailing, is perfectly played by Margaret Ockenden, with that rare gift of hers to sustain a part she is playing right to the end. Ray Hopper, in the part of Gaston, the general’s secretary, gives a remarkably fine performance as the young man who sweeps the daughters of the general off their feet. Carol Petherwick and Rosalind Tripp play these parts with credit. Barrie Bowen portrays Dr Bonfant with a quiet confidence, which is the mark of all good character actors, and Audrey Laye gives a sensitive performance as Madam Dupont-Fredaine. Making an all too rare appearance on stage these days is George Porter, who has directed so many of Wick’s past successes. He plays the part of Father Ambrose and he always gives just the right note to any part he plays. Effective portrayals are also given by Susan Stinton and Miranda Bowen as the maids. Other credits go to Douglas Tucker, Frank Hurrell, Terry Gibbs, Frances Thorne, Margaret Davy and front of house manager Paul Carpenter, for making this play so worthwhile to see. Jean Anouilh’s Waltz of the Toreadors, currently presented by the Wick Theatre Company, is a strange and delightful play. General St. Pé tends to dwell in the past and imagine himself to have perpetual youth. His devotion to his demanding wife, while dreaming of romantic conquests, his long devotion to Mlle. Ghislaine de St. Euverte and the ultimate outcome of it all give a play with humour, pathos and sometimes frightening insight into foibles that we may perhaps recognise in ourselves. Jon Peaty has directed with an obvious affection for the play but for my money the whole thing could have been lighter. Jack Bingham as General St. Pé seemed to me to lack one essential feature – dignity. At times he appeared to be more of a regimental sergeant-major than a general. His complaining conniving wife Emily is well played by Margaret Ockenden in a difficult rôle that could become tedious but is never allowed to become so. The general’s secretary, Gaston, as played by Ray Hopper has a pleasingly whimsical quality that will delight you, and Barrie Bowen as Bonfant attending on Emily as well as being an old friend of the general gives a typically smooth performance which seems always to be right. Hilary Wiltshire has the rôle of Ghislaine which demands charm and excitement and brings these qualities to her playing. Audrey Laye appears as dressmaker Mde. Dupont-Fredaine, Susan Stinton as the maid Eugenie, George Porter as Father Ambrose and Miranda Bowen as a newly-engaged maid, Pamela. Carol Petherwick and Rosalind Tripp, who are seen as the general’s daughters Estella and Sidonia, are obviously very inexperienced and will improve with time.